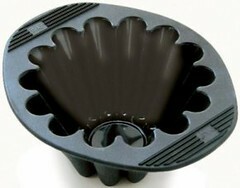 As I mentioned in the previous post, the folks at KaTom were kind enough to give me a silicone brioche mold to give away to a lucky Nosh With Me reader! To enter the contest, simply tell me something–anything–about yourself. I like to know a little about my blog readers. Contest ends at 11:59 p.m. EST on Sunday, November 23. One winner will be selected at random on Monday, November 24 and contacted by email shortly thereafter. Please note this contest is only open to residents of the U.S. and Canada. My favorite thing in the realm of baking is trying things the old-fashioned (and usually, the hard) way. I love history and baking this way is a great way to be in touch with the past! I have loved baking since I was little. I love trying out new recipes and gadgets. Making family passed-down recipes is also a favorite. I love desserts so much that I usually give up the meals I plan on eating if there is cake or any other baked good lying around. I can eat an entire frosted cake easily, and it is so worth it : ). I have a weakness for pie crusts and cat paws. I celebrate surprise unbirthdays and like nothing more than to send secret presents in the mail. I found your blog while researching pastry arts programs (hopefully starting next semester already!). I love to make bread (Joan Nathan’s challah is my favorite too!) and I’m not allowed to show up to birthdays without my brownies in hand. I’m in college, majoring in clinical nutrition and human development. I love to cook and bake, but I HATE most sweets. I’m more into salt and cheese than sugar or chocolate. But since I love to bake and don’t like to eat what I bake, it turns out well for the people around me. I have always wanted to make brioche but it seems so… intimidating. I am about to have my first child, and I have gestational diabetes, so I am VERY excited to be able to eat bread, and sweets again! If I could go back in time I would go to culinary school…I cant deceide if I enjoy cooking food or baking more! I am a cooking addict cooking mostly bistro type meals. I am hoping to branch into baking more this winter. I am a newlywed, married one month today! I love to bake in masses, but my husband isn’t a fan of anything fancy or unusual. So I bake my little heart out only to give away the final product to friends and neighbors. My first entry into the baking world was when my Uncle Willis would “hire” me to bake his wife’s birthday cakes! I loved making them very special! He was always so sweet to me and always overpaid me for my efforts. My favorite thing to bake is just simple shortbread. And I’m excited to teach myself candymaking this holiday season – starting with caramels. Mmmm. I speak five languages and I’m currently learning a sixth. i love to make bread but brioche kind of scares me. if i buy it, i can pretend i don’t know how much butter goes into it, but when i make it i am faced with the cold, hard (or possibly room-temperature) truth and i feel so guilty. until it’s baked, and then i feel like eating it! Something about me, huh….I have 3 dogs (all dachshunds) and 2 cats. What can I say, I like animals. I have a 2 year old daughter, who’s first birthday cake was my first real expidition into the baking and decorating world – since then i’ve been obsessed with baking and cake decorating! Funtimes. I am a overworked graduate student in the biological sciences. Reading food blogs makes me feel like a sane, normal person…. and it’s a lot healthier than baking/cooking everything I see then eating it in one sitting! Let’s see: you already know where I live….ummmmm…I never win these contests and I don’t expected to win this time. I’m a twin; my twin sister had twins – as you might have guessed, I’m not having kids. 😉 Instead, I spend my time collecting cookbooks and reading them as if they were thrillers, marking recipes to try, and forcing my housemates to enjoy the spoils! I tend to do really simple baking when I’m alone, but when my boyfriend is around we test out new recipes! I interned as a chef in Tuscany, ITALY!!!! Let’s see.. I have two kids, live in Central Illinois. I bake a lot, mainly cookies. I work for a small non-profit that provides services to migrant families in IL and TX and really love my job. Love to cook, love to eat, love to read food blogs. I have been wanting to try some of the recipes in the book my SIL got me, but I haven’t had two weeks uninterrupted to make sourdough starter. Maybe I can start tonight. And I’m an Aquarius, and I have green eyes, and I love long walks on the beach. I am a food blog addict , mom to 4 and a baker at heart. Children are my lifes work. I am REALLY bad at mailing things. Really. I love to bake. My favorites are cookies and banana bread. I have three little boys (4, 2, and 8 months) two of which love to help me, (It’s only a matter of time till it is all 3) which is why I usually stick to the simple stuff. My secret desire is to train them into chef’s. Or musicians, rock and roll musicians. Either way I could be happy. I found your blog via justjenn, and I wish that you posted more often. I love your recipes! and I wear shoe size 10. I grew up in a baking and cooking challenged house. The family joke was always, if it smells like smoke then dinner’s done. To this day my mother wonders where I got my knack for and love of baking. I consider it my zen. While some people read a book to relax, I immediately rush to the grocery store to pick up ingredients for a new recipe I want to try and spend my evenings in the kitchen. I love your website and I love to bake – pretty much anything sweet! I have 3 small kids and a husband who love to eat all the experiments! Thanks for all the great ideas! I love my Kitchen Aid Pro Model and i enjoy using it for cookies, cakes, pizza dough and homemade ravioli with the pasta attachment. Baking is fun and so great to share with others. I have loved baking for as long as I can remember. Growing up and into most of my adult life I had sever self esteem issues. After a long day of being beaten down at work I come home and bake something which relaxes me and then I get the self esteem boost when people tell me how good my baked goods are. When people come over to our house they head straight to the cookie jar and if it’s empty they start loking for pie or cake plates. I love that! My favorite television show is It’s Sunny in Philadelphia. I’m (not-so) secretly intimidated by the idea of making my own pie crust. Ya know, the pressure of it being flakey yet solid, the pre-baking versus not – tried it once, and I’m not ready to go there again yet. I got my love of baking from my mom, who made things mostly from mixes! But she was great at decorating cakes, and I learned a lot from her about how to swirl and frost. I am from Edmonton Canada. I love baking but am not very good at it. I burn thigs alot, but my family still eats it to make me feel better. Last year I bought a 60-year-old house with a kitchen that had never been renovated. Then I convinced my now-husband to help me re-build the kitchen, ostensibly to improve the value and functionality of our home…. but it was just as much because I had no counter space to bake and no cabinet space to store all my baking accessories. I love to cook & read food blogs. I have 3 kids that are picky so it makes cooking very challenging. I love to bake. With 2 daughters raised I’ve discovered that only one of them got the cooking gene! I grew up on a farm with grandmothers and a mom who baked a lot, especially at harvest time! Newly married… my fantastic husband let me use all of our Macy’s wedding gift cards to buy a Kitchen Aid Mixer. Now THAT’s a keeper. I’m a college Sophomore living in a dorm, but I try to bake something for my friends at least once a week. The very first thing I baked after moving in was brioche (I used a muffin pan 🙂 ). I taught 1st graders this week what a whisk is and we made instant pudding as part of a How To unit! I learned about cooking & baking early on in life and am so glad to pass it on to another generation. I love to read cookbooks. I think I will try the recipes but mostly I just read them.